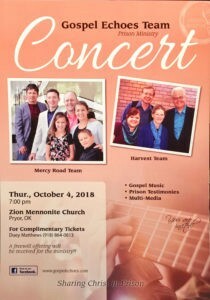 Gospel Echoes Team will hold a Gospel Sing at the Zion Mennonite Church, Thursday, October 4, 2018 7:00 PM. The evening will include Gospel Music by the Harvest and Mercy Road Teams and Special Guest testimony. From a life of hopelessness, drugs and crime to prison chaplain and drug counselor. Transformed by the power of Christ.